When did you first start painting and how did you start you art career? Art has been a part of my life from a very early age. 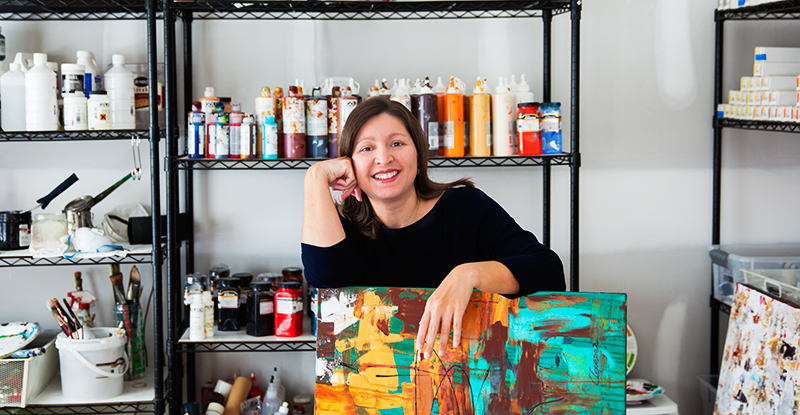 I started painting full time after my son was born, and I found peace in the art. First, I started experimenting with paints, pastels, pastes and any other medium to the point where I was truly happy with my paintings. As I progressed, I created my website, blog, and a portfolio. I participated in gallery exhibitions, and art auctions, and found local businesses to showcase my paintings. As an emerging artist, I was hoping to conquer the business side of art by selling my paintings domestic and internationally, and licensing my images for variety of products. What artists have inspired you (modern and historically)? Honestly, the list of artists that I admire is way too big to list. I love many media and styles. When I was a child, I remember being fascinated with renowned masters and artists from Venezuela, like Oswaldo Vigas and Jesus Soto. Nowadays, I am grateful to be in the age of the internet and social media because it is easy to find emerging artists of different cultures and enjoy their diverse art. I don’t have a particular, defined style. I create a number of different subjects with a unified idea: “Joy”. I believe artists don’t necessarily have to continue in one style for an entire career. Art is a form of expression and some days I want to move in a different direction. It is fun to experiment all the time. Every canvas is a path for new journeys. Sometimes I start a painting with one idea, but my intuition and emotions lead me through the process. There is an opportunity, a language that I am interested in exploring. I work in many layers towards a balanced harmony. Coming from a Latin culture, warm colors and bright accents are usually found in my art. Every canvas is a learning experience and during the process I continue to grow as an artist. how do you bridge the gap of the business side of art? I spend lots of time researching online about marketing, finance and in general how to sell art. I am still in the early stages of the business side of art. There are many areas in which artists must understand the basic fundamentals whether we sell directly to your collectors through a gallery or online stores, we have wholesale accounts where stores buy and resell your product, or even we hold royalty fee contracts by granting licenses to companies to use our images for variety of products. Business management is important to any form of self-employment, and art is not an exception. What do you think are the biggest struggles of an artist? From my experience, the biggest struggle as an artist is being determined and persistent through financial hardship. The work of an artist represents evolution and forms the basis of tomorrow’s history. Artists communicate new ideas to the world, and it is a shame when they cannot succeed due to lack of resources. Where do you find inspiration, and what motivates you to keep going? I find inspiration in the people, nature, places, music and really anything around me. Art is freedom and enables me to find myself. My paintings reflect who I am and are truthfully a reflection of my soul. It motivates me when a piece of work provokes different reactions and feelings. Everything leads up to that moment! Just nurture your artistic passion and never lose the aspiration of pursuing your art career. Believe in yourself and in your artistic skills. If you are looking to sell your artwork and put it out there, it takes time and lots of effort to get people to know you; but nothing is impossible. If you want to be a successful artist, you have to promote and market your work. As you evolve, your art evolves. Set goals and work to achieve them, stay focus and keep the good work.